RCMRD organized a three day internal training on GMES and Africa Products and services. The GMES East Africa internal training workshop was held from 24th to 26th October 2018 at RCMRD premises in Nairobi. It was aimed at sensitizing the project team on the project and creating a common understanding of each application. The workshop was officially opened by Prof. John Kyalo Kiema the Director Technical Services at RCMRD. In his opening remarks, he emphasized on the need for timely provision of services and providing quality products in such a way that the communities would benefit from the project. He highlighted the importance of the project to RCMRD in achieving its mandate in the region. 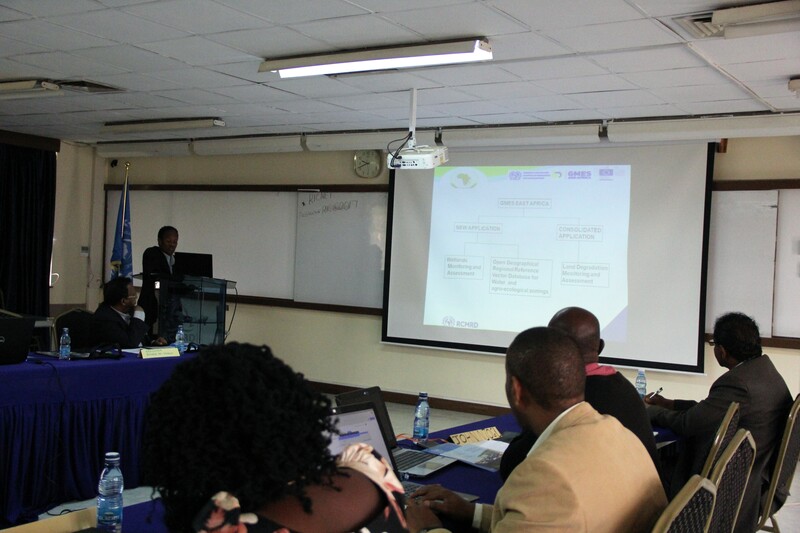 The project lead, Mr. Degelo Sendabo made a presentation on GMES East Africa project. He informed the project team that the number of countries to be covered under GMES East Africa had reduced to 10 following discussions with AUC and other consortia. The 10 Countries that remain under GMES East Africa are: Sudan, South Sudan, Eritrea, Djibouti, Ethiopia, Kenya, Rwanda, Somalia and Mauritius. His briefing on the project included understanding the needs of the stakeholders before supplying the services, and ways of meeting the demand through communication, visibility and marketing among others. The training covered all the methodologies and activities to be applied and accomplished during the project implementation time frame. The three thematic areas include:i) Land Degradation Monitoring and Assessment (LDMA), ii) Wetlands Monitoring and Assessment and iii) Open Geographical Regional Reference Vector Database for water and agro-ecological zonings (RRVD). The project partners are Rwanda Water and Forestry Authority (RWFA), Ethiopian Geo-Spatial Information Agency (EGIA) and Makerere University. The three main partners will help with implementation of the project. Makerere will spearhead trainings in the project countries. vi)Result 6: A well-established M&E framework for sustainability of application. The workshop was attended by: Mr. Degelo Sendabo,Ms. Dorah Nesoba, Ms. Rose Waswa, Ms. Eunice Wangui, Mr. Josphat Makanga, Mr. David Ongo, Mr. Joseph Chemutt, Mr. Vincent Mtaroni, Ms. Pauline Ogola, Mr. Patrick Kabatha, Mr. Edward Ouko, Mr. Lawrence Okello, Mr. Abdi Gedi, Mr. Julius Buyengo, Mr. Ngugi Kimani and Mr. Aaron Ochieng’.